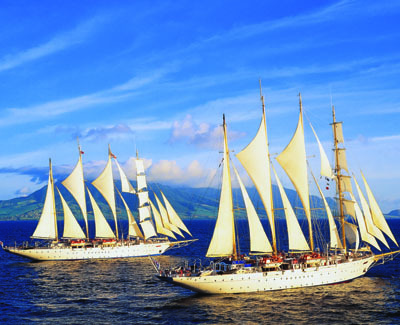 If you're a romantic at heart, a voyage with Star Clippers is sure to stir your soul. • A $150 Shipboard credit per cabin based on double occupancy. If you're a romantic at heart, a voyage with Star Clippers is sure to stir your soul. It's hard to imagine a more glorious experience than being aboard one of its three reproduction clipper ships, a salty breeze gently caressing your face, while white canvas sails billow overhead against an azure blue sky. Experience the ultimate seagoing adventure, balancing the splendor and tradition of sailing with the superb service, amenities, and accommodations of the finest private yacht. Local performers onboard provide an authentic taste of the destination while the Captain and crew bring a sense of camaraderie. Whether it's Yoga at Sea, a Celebrity Guest Chef, or relaxing under the sails and stars, there is something for everyone. The line's two sister ships, Star Clipper and Star Flyer, carry just 170 passengers each, while the majestic five-masted Royal Clipper carries 227 passengers in a style reminiscent of the golden age of sail. Since these ships are small, you can easily interact with the captain, rub shoulders with the very international crew, make friends with your fellow passengers, and even lend a hand in the nightly ritual of raising the sails to catch the evening breeze. On the two smaller ships, you can climb (with a harness) to the crow's nest, complete with a comfortable settee, for unforgettable 360-degree views. Each ship's atmosphere is relaxed, yet every aspect of life on board is filled with little luxuries . . . lots of space and privacy, elegant interiors, fine dining, and extras like Thai massage. Plus, because of their size, these yacht-like ships can visit out-of-the-way ports the large ships can only dream about, in places like the Mediterranean, the Caribbean, Thailand (Phuket), and Indonesia. Under construction in 2017, Star Clippers is soon to launch its brand-new, five-masted ship Flying Clipper — based largely on the grand 1911 sailing ship France II, and currently the largest sailing ship in existence. With just 150 cabins, including 34 balcony cabins and four owner's suites, this magnificent ship will sail in the Mediterranean in Summer and the Caribbean in winter. Founded by Mikael Krafft, the ships of Star Clippers are the realization of Mr. Kraft's dream of replicating the golden age of sail by building authentic sailing vessels with modern comforts, capable of sailing to small hidden harbors and secret coves worldwide. For the experience of a lifetime, Sail a Star!